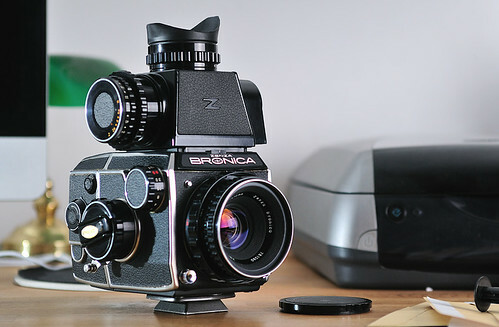 The Bronica EC is a 6x6 SLR camera manufactured by Bronica and was released in 1972. It replaced the Bronica S2A in the line up. It is called EC because it has an electronically controlled focal plane shutter. It is compatible with the lenses from the previous models S2A, S, etc. Similar to previous models the most common lens often bundled is the 75mm Nikkor f2.8, but problems with Nikon forced Bronica to consider other options so they decided to start manufacturing their own lens. Bronica still need a lens quick, the lens changed over to one marked "80mm f2.8 MC Zenzanon by Carl Zeiss Jena DDR" based on a Biometa type design. The mirror design was also changed to a split design. The film back and viewfinder system has been changed and are not compatible with the previous models. The film back now has a handy pocket to store the dark slide. The view finder now supports interchangeable magnifiers along with five different focusing screens. An optional TTL exposure meter finder is available for the system. It is based on a CdS sensor element. Two different sized tripod mounts are available on the base of the camera in both 1/4 inch and 3/8 inch diameters. 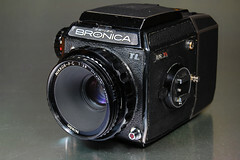 A variation known as the Bronica EC-TL introduced in 1975 adds a built-in TTL exposure meter. 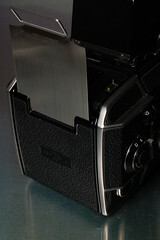 This is the last focal plane 6×6 SLR manufactured by Bronica. 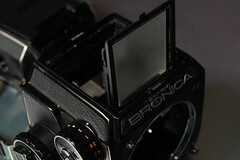 The Bronica SQ series of 6×6 leaf shutter cameras replaced it in 1980. This is one of the first 6×6 format camera with built-in TTL metering as well as a aperture priority exposure mode. The meter has a measurement range 4 to 19 EV at ASA 100. The shutter dial center has the meters ASA setting, to change press the center and rotate. It has a maximum sensitivity of 3,200 ASA. The red A on the shutter dial is aperture priority mode, the red dot is for a 1/40s shutter speed usable without a battery. The EC-TL focusing screens has the shutter speeds printed on them. The dept of field preview button also doubles as the meter read button, pressing it will illuminate the shutter speed in the finder screen. A noticeable improvement is the included waist level viewfinder had been changed a bit from the previous model. The magnifier portion no longer leaves a gap for light to enter. 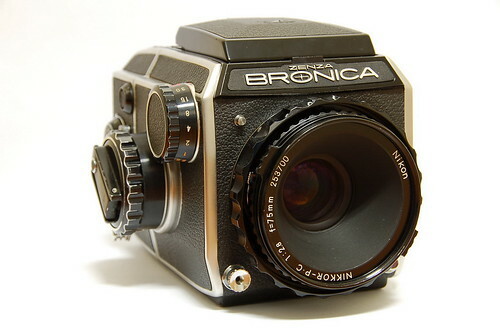 A revision often known as the Bronica EC-TL-II was also available. The electronic boards have been changed. Many feature have been removed such as slow shutter speeds 4 to 1 seconds, because of that different finder screens are required compared to the EC-TL. The light meter no longer works when in manual exposure mode; it lights the M indicator in the finder screen. The finder screen no longer displays slower than 1/30 of a second. dark slide storage pocket on film back. Lens mount interchangeable with Large bayonet, small bayonet and 57mm screw mount. Finder Fresnel lens and large magnifier interchangeable with TTL exposure meter. Shutter Speeds B, 4, 2, 1, 1/2, 1/4, 1/8, 1/15, 1/30, 1/60, 1/125, 1/250, 1/500 and 1/1000. This page was last edited on 26 December 2015, at 03:19.